Ke Chin, who later would become Keaton Poulter, was orphaned at birth and lived the first year of his life in a hospital in Taitung. He had heart surgery that first year to repair holes in his heart. 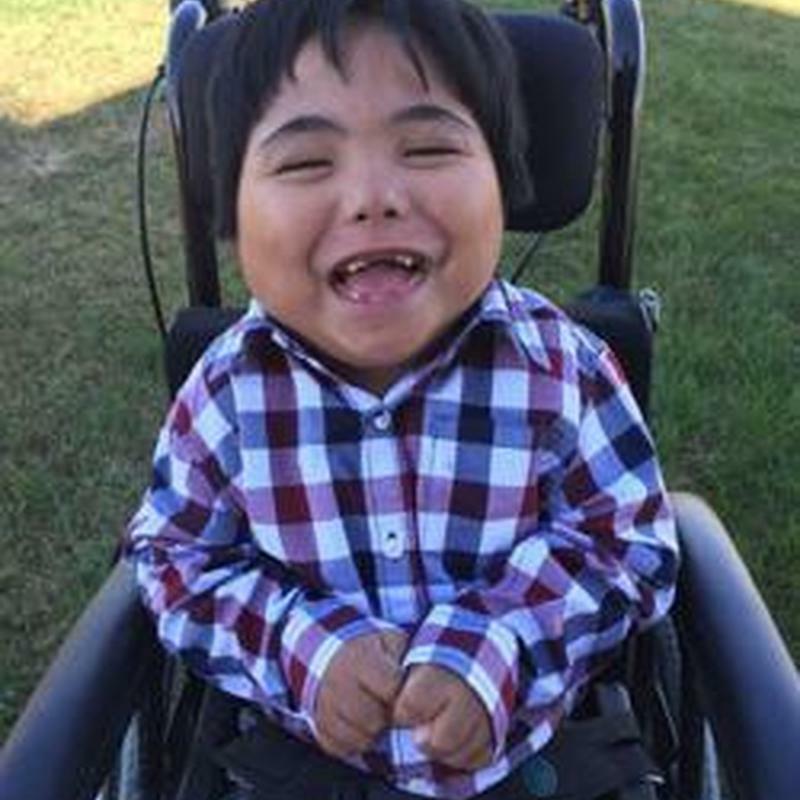 When he was released he lived in a nursing home because his medical needs, including cerebral palsy, were so complex that no orphanages would take him. New OEM Software http://bestbuysoftware.online/ provides great discounts and savings of up to 80% on Adobe , Microsoft, Apple, Coral and Nuance software. 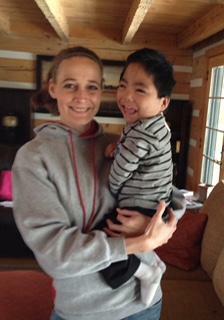 Mandy and Matt Poulter worked with Morning Light Home Taiwan to adopt Keaton. While waiting to finish the adoption process, they posted photos from the international adoption agency on their refrigerator in Texas, praying and waiting for the day they would join them in person. Here's another photo from that refrigerator. "When we flew into Taipei, Taiwan, we were supposed to catch a quick one hour flight to Taitung. There was a typhoon going on so all flights were canceled. I was panicking and thought we need to get to Keaton as soon as possible, so we bought train tickets to Taitung. While on the train there was a mudslide that went down the side of a mountain onto the tracks, due to the typhoon. The first two cars of our train were dangling off the side of a mountain. We were all immediately evacuated from the train and bussed to the next train stop to catch another train. Quite a whirlwind trip!" When they finally made it to the nursing home on June 15 and met Keaton, he was crying. He stopped as soon as Mandy picked him up. Mandy explains other photos from the trip to Taiwan: "Photo of Keaton and I with the nurses who cared for him in the NICU for the first year of his life. Photo of Keaton and I with Deana and Luke Pan and their 4 children at Taitung Baptist Church in Taitung, Taiwan. Luke is the pastor there. Deana is the missionary who helped us with all of Keaton’s paperwork in Taiwan and she pushed his paperwork through in record time. Photos of Matt and I sightseeing with Keaton. We went to Taipei 101, Botanical Gardens, and many other sights of Taiwan." Keaton had two homecomings: First at the Kansas City airport, where grandparents, aunts and uncles greeted him, then when he reached his new home in Flower Mound, Texas. "We actually went with the name Keaton because the KE at the front of the name was a similar sound to what he had grown up hearing." Mandy remembers: "We went swimming for Ethan’s birthday at the community pool. Then we came home and swam in our backyard pool. Keaton always loved the water. 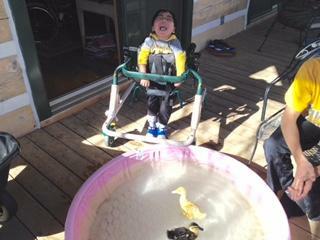 He thought it was so funny when we would help him splash his feet in the water." Mandy explains: "Nana and Granddad Poulter always give each child a gift card to build their own bear when they join the family. Our kids had a great time helping Keaton create his very own bear with a karate outfit and glasses." Mandy recalls Keaton's first months in his new home: "He had many doctor visits and a surgery just a few weeks after he arrived to place a G-tube in his stomach. You can tell the before and after pics from if he has a tube taped to his face or not. He was so happy not to have that thing in his nose anymore. The kids loved getting to know their new little brother and loved helping out with him whenever they could. There is a picture that I love in here of Ethan holding Keaton during one of his feedings. Keaton’s brothers and sisters always had something fun planned to do with him and loved learning all they could about his medical needs. Keaton just fit perfectly into our family and enjoyed every second of being the little brother. You can tell from the giant smile on his face how very loved he is!" Keaton in traditional Taiwanese clothing. Brothers and sisters with their shirts from Taiwan. Mandy remembers: "We took Keaton to the Dallas Zoo. The kids loved showing him all the animals. Keaton always loved animals and visiting the zoo was one of his favorite activities." Keaton's adoption becomes final. Mandy remembers: "This was such an exciting day for our family. Keaton officially became a Poulter!!! We are blessed beyond measure to be his parents, brothers and sisters. He was so excited to finally have a family of his very own." Keaton met Nana and Granddad Poulter on a trip to Omaha's Henry Doorly Zoo. 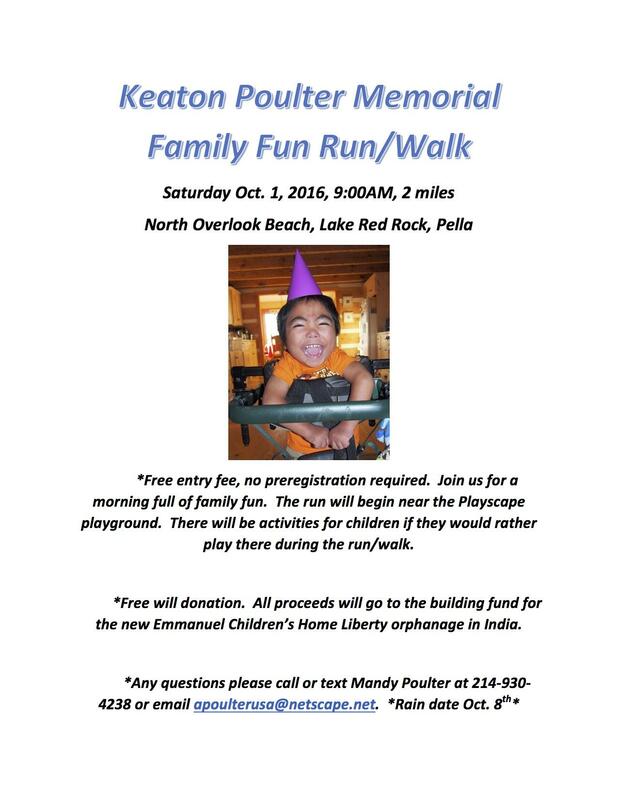 Mandy remembers: "Keaton loved celebrating his special day with his family. Keaton would get so VERY excited whenever we would sing the 'Happy Birthday' song. It was one of his favorites. He would smile so big his little eyes would disappear. We sang it to him so many times each year on his birthday." At the pumpkin patch in Flower Mound and trick-or-treating as Mickey Mouse. Keaton’s middle name is Zachary after his Uncle Zachary. Mandy remembers: "They always had a special bond and Zach just adored Keaton. I love this picture because they both have the same adorable smile on their face." Mandy remembers: "This was such a special Christmas for us because it was Keaton's first Christmas. We enjoyed making Christmas cookies, decorating the tree, and a lot of fun on Christmas morning! We always enjoy going to the Corral in Shenandoah to have a big family Christmas get together with the Buttry side of the family. Keaton had so much fun opening presents and playing games with his cousins, aunts and uncles, and grandparents." Mandy remembers: "Easter morning is always a special time to remember Christ and His gift of eternal salvation that He offers each one of us. Keaton had fun hunting for Easter eggs and attending the Easter service with his family." This was the first family vacation we went on with Keaton. We weren’t sure how he’d do and he did wonderful!!! He loved riding on our backs during hikes, playing at the waterpark at our hotel, and seeing the sights. Keaton's brothers and sisters were amazed that, with his new stander and feeding tube, he could stand, sleep and eat at the same time. Mandy, Keaton's mother: "Every day I look forward to seeing this big happy smile again someday in heaven." Keaton became an official U.S. citizen. Mandy, looking at his citizenship certificate, noted, "his hair was looking a little crazy that day :-)"
Mandy remembers the summer fun: "With Great Grandma at a family reunion. Fun with brothers and sisters. Picture of Keaton with his new leg braces. Photo of Keaton in his new blue Special Tomato chair with his hand activated switches that would activate his toys." Mandy remembers: "We spent 4th of July in Shen with Granny and Grandpa Buttry, aunts, uncles, and cousins. We were in a parade in Shen and walked with the military in memory of Brandon. Keaton had fun at the pool with Granny." Sister Maya plays peekaboo with Keaton. "It's one of my favorites because I LOVE his laugh!" says mother Mandy of this video. Mandy remembers: "We celebrated in Pella and went to Lake Red Rock. Keaton always loved his special day and got spoiled by his family. He would get very excited to have is siblings help him open his presents." Keaton and his family visited Uncle Austin at the Iowa Department of the Blind for his birthday. Mandy: "This is the day Keaton got his customized wheelchair. We went to Target afterwards and Denzel thought these glasses were super funny. This is Keaton's first ride in his very own wheelchair." This is Maya as Doc McStuffin, Chelsea as Lammy, from DocMcStuffin, and Keaton as Stuffy, from the Doc McStuffin cartoon. Mandy remembers Keaton's fall fun: "We went to the pumpkin patch in Grinnell, Iowa. Keaton loved playing in the corn. He was Stuffy from Doc Mc Stuffin for Halloween. Maya was Doc and Chelsea was Lammy. He had fun trick or treating with all his cousins." Mandy remembers: "Christmas is one of our favorite holidays. So much family fun and activities. Keaton couldn't wait to see what Santa had left for him this year!" Keaton enjoys bubbles with his sister Chelsea. Fun at a hotel and ski lodge. Making Valentine boxes and celebrating Valentine’s Day with the family in Pella. Mandy: "Keaton with the special bear he got from First Baptist Church of Shenandoah, Granny and Grandpa's church, for his upcoming eye surgery." Mandy: "The heavier Keaton got, the more creative Denzel got in ways to carry his little brother around the house. :)"
A visit with Keatons Rock cousins in Minnesota included sledding and a trip to the Mall of America. Mandy: "Keaton loved watching the new baby ducklings. He thought they were SO VERY funny!!!" Keaton swings in the park. Mandy remembers: "Keaton was overly excited about his birthday this year. He really understood what birthdays were about and couldn’t wait for his special day. I love the picture of him in his walker with his birthday hat. The smile on his face says it all! He loved this day so much and was so happy about each and every gift he opened." Mandy remembers: "Another special Christmas morning to remember the birth of Christ. A lot of smiles from Keaton while he was making cookies, decorating the tree, and enjoying time with his family." Mandy remembers: "A beautiful spring day that was filled with Easter fun searching for eggs and celebrating our risen Lord!" Mandy remembers: "Keaton’s favorite parts were the Dumbo Ride, It’s a Small World and meeting the characters. He would get the biggest smile and sometimes get embarrassed when the characters would come up and talk to him." Keaton and his mother and siblings send Mother's Day video greetings from Florida to his grandmother, Pam Buttry. Mandy remembers: "Keaton had fun splashing in the waves and watching the seagulls. He also enjoyed playing in the sand with his brothers and sisters." Sister Whitley takes Keaton down the water slide. 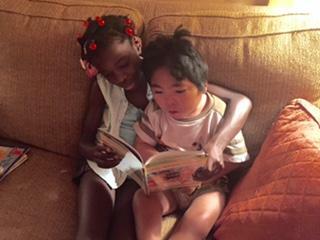 Mandy: "Keaton LOVED it when we read stories to him. This is one of the things we all miss the most." On Keaton's first day of kindergarten, he is pictured at his desk, with his teaching associate, Pam Hartman, with a friend and with the class. Keaton's brothers and sisters loved to help him. Here Chelsea helps with a breathing treatment. These photos and video are from Keaton's last birthday. The More Bears! book, a gift from his Aunt Missy and Uncle Andrew, was a custom book with his name and photo in it. Mandy remembers: "Fun at the pumpkin patch, carving pumpkins. Keaton was Olaf for Halloween, Maya was Elsa and Chelsea was Anna from Frozen." Family photos were taken by the Poulters' friend Sarah Turnbull. Pictures from Keaton's last Christmas. Mandy remembers: "Christmas dinners are always celebrated with traditional English Christmas crackers. Keaton always loved wearing his paper crown and seeing what special prize he got in his Christmas cracker." Fun playing with Granddad Poulter and celebrating Nana Poulter’s birthday. Being able to spend time with our grandchildren was a wonderful addition to our life experience. A picture of Keaton smiling is at my workstation and I cannot help but smile back everyday. Preparing for Valentine's Day with Maya. This was one of the last photos of Keaton. "It was on a Saturday and The following Thursday he went to be with Jesus. It is a little basketball program for special needs children in our community. The little girl, Lucy, that it's name for, is adopted from Africa. She has multiple special needs and her dad runs the basketball programs in town. ... It was just a very special day because it was the last photos and videos we have of him. It's a fun very special event for special needs children that him and Chelsea have participated in the past two years." The lead photo in the album is the last picture taken of Keaton. Keaton passed away because of complications from the flu on Feb. 18, 2016. His grief-stricken family shared this celebration of life at his service Feb. 22 at Liberty Evangelical Free Church. "The teddy bear that is on the front is a picture of the bear we gave him when we first met him in Taiwan. I actually carry that bear around in my purse with me every day. We had the bear holding six balloons for our six children who are still with us, and the seventh balloon going up to heaven to represent Keaton. "The kids helped us choose what to put around the top of the base. Some of our favorite memories of Keaton. I tried to take it in four different pictures, it wraps around the top of the base. It says, 'We are forever blessed to be your family. Will always remember your unspeakable joy, big smile, giggles, reading books, Chewy, bright eyes, our biggest fan, so ticklish, your unconditional love, our baby boy.'" "We will be having a free will donation to help build an orphanage in India that our church is working on. "Keaton's life will continue to impact us and many others in such amazing ways. The love he brought to our family will continue to grow as we find ways to honor our Keaton, while helping others and orphans in need." "For the Christian, death is not a tragedy but a glorious promotion, not the sad end, but the glorious beginning. Sometimes we hear people say how sad it is that one should die so young. Many of the fairest buds that ever grew on earth have blossomed in heaven." Happy Heavenly Birthday to my best little buddy! The pictures were wonderful. Will always remember his big smile whenever I talked to him. Love you lots sweet boy!! Mandy tells about the bench dedicated in Keaton's name at his elementary school. "This is a bench that Keaton's elementary school put out in front of the school in memory of him. I just love it! The school colors are green. The saying is just perfect for Keaton. It is a saying by Winnie the Pooh. The bench says,"Always wear a smile because your smile is a reason for many others to smile." Nothing could describe Keaton better than his smile. He always had such a big smile when he went to school, and always. He just loved his teachers and all the kids. They were so kind and loving to him and we are truly blessed by the many people who touched our lives and Keaton's at Madison Elementary School. The little tree planted behind the bench was also planted in memory of Keaton. It is a tulip tree. It's winter so obviously there are no leaves on it, but in the spring it will have a beautiful yellow flowers. After I took these pictures and was looking at them on my phone, I thought the picture of the nameplate was blurry. Then all of a sudden I realized it was beautiful sunbeams shining through the letters of the bench. It brought a smile to my face thinking about how Keaton was such a beautiful ray of sunshine in our lives, and how he must be shining his beautiful light down from Heaven to be a part of that picture. I also love the rays of sunshine coming down on our kids as they are sitting on Keaton's bench in the last picture. Just a reminder that sometimes it feels like Keaton is so far away, but we know he is not and we will be with him again someday in glory!"